Kraftig par 64 LED lampe, der giver et lys med færre RGB skygger i kraft af 3-i-1 dioderne. 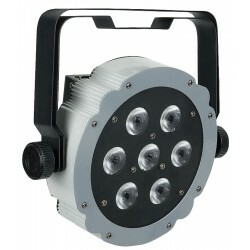 The new Showtec LED Par 64 18x 3-in-1 Parcan offers perfect colour mixing and a perfect lightoutput. Due to its digital addressing setting up is easy. For versatile use it offers DMX control, music control and master-slave control. The fixture is equipped with 7 built-in programs for stand alone use. For all stand alone programs speed and strobe can be adjusted.